Everyone knows that surfing is really difficult - and it always seems that everybody finds it much easier than you do. Well, that’s pretty much the truth. But, as if it isn’t enough to master the actual act itself, there are rules of behaviour in and around the water that everybody should obey. This applies no matter how rubbish you are and so, although at times it seems that they are just there to make it more obvious to everyone else that you really are the shittest in the surf, their real purpose is for the safety and respect of all other water users. The main points are summarised below, however if you are a crap surfer there are a few extra little points that may help the overall experience. You won’t annoy other surfers in the lineup (provided that you can get out to it!) if you try not to 'drop in'. If you are nearest the foam/white water or breaking part of a wave in either direction - left or right then you have priority on the wave. If you take off on a wave when another surfer is already up on it, coming at you, you’ve dropped in. The chances are that you’ve already done this by accident if you’re crap enough – that’s why that guy was shouting at you. You are ‘Snaking’ if you deliberately paddle inside of a surfer who has priority. Think of it as very bad or rude positioning, or ‘pushing in’. If somebody catches a wave early, say before it breaks, and then you catch it on the inside nearest the white water then you are snaking. 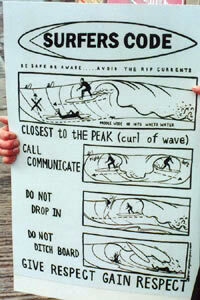 Can also mean paddling around someone and then getting nearer the breaking wave. As this requires considerable surfing skill, the crapsurfer will probably only ever witness this second-hand. Theoretically, you should never let go of your board. Now, the problem is that if you’re a bit rubbish this is nigh on impossible. But next time you are in the water and you are forced off your board (some people actually jump off through choice) Try to grab the leash close to the board before it shoots off to clatter some toddler in the ankle high foam next to you. You’ve got to look where you are paddling when you are going out through the waves, to where the good surfers are, i.e. make sure you’re not in their way. Also, when you are taking off, i.e. not just looking behind you at the approaching wave but ahead too at the point where you will probably ‘pearl’. Never warm up on the beach, just in front of the waves, in full view of everyone. Why draw attention to yourself? If you have to do it - and you don’t need to for knee high push offs in white water - then the back of your car is the best. Failing that, put a towel over yourself in the car park. Always hide your key under one of the wheel arches of your car. Otherwise the thief may not know where to look for it. Try to walk as far as possible into the waves, leave the paddling until the deepest part, and if the waves are quite big you can always try to stop them hitting you by putting your board out flat in front of you to protect yourself. Never sit on your board if you can lay on it. It’s much easier. Pretend you’re great and not rubbish at all. This is the only point at which strangers don’t know how crap you are. Milk it. Unless they’ve seen you doing the ‘walk of shame’ of course!